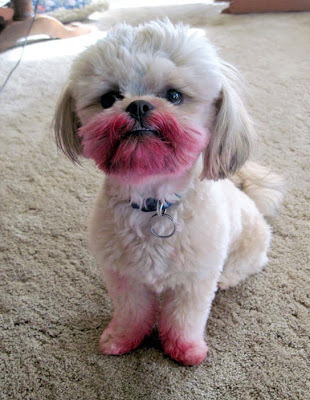 No I have not seen your lipstick, why would you even ask me that? I'm insulted! Every time something goes missing around here, everybody looks at me! Don't leave cats out, KC...I have three and I can always tell when they think they've done something wrong. OMG! I had a dog once that got my air fern(remember those? )the day before St Paddy's Day and she had a green face and paws just like that. Toke forever to wear off too! LOL. Too funny! I vaguely remember the air fern.